At 10 am on June 16, more than 500 boats will embark on the world’s largest regatta in enclosed waters with their spinnakers raised, providing a magnificent sight in glorious technicolor for sailing fans. Watchmaker Corum is proud to associate its name with this event on the Lake for the third consecutive year and is presenting a watch dedicated the occasion – the Admiral’s Cup 44 Chrono Centro Bol d’Or Mirabaud. The partnership with the Bol d’Or Mirabaud is a logical step for Corum, which has been saiing the high seas for more than 50 years and supports large-scale projects such as the French challengein the America’s Cup, the Peyron brothers’ Energy Team. Says Antonio Calce, Corum CEO and partner, “While sailing is undoubtedly the core of Corum’s international sponsorship strategy, more than anything the company identifies with unique moments in sport and human adventures. We have always supported local regattas and I am proud to be able to support all the participants in the Bol d’Or and to motivate them by rewarding the winners of the Bol d’Or and the Bol Vermeil with a Corum Admiral’s Cup watch”. Part of the brand’s sailing collection and specially designed for the event, the Admiral’s Cup 44 Chrono Centro Bol d’Or Mirabaud is equipped with a central chronograph function. Its sporty look is demonstrated by the velvety matt finish of its 44mm vulcanized rubber case. 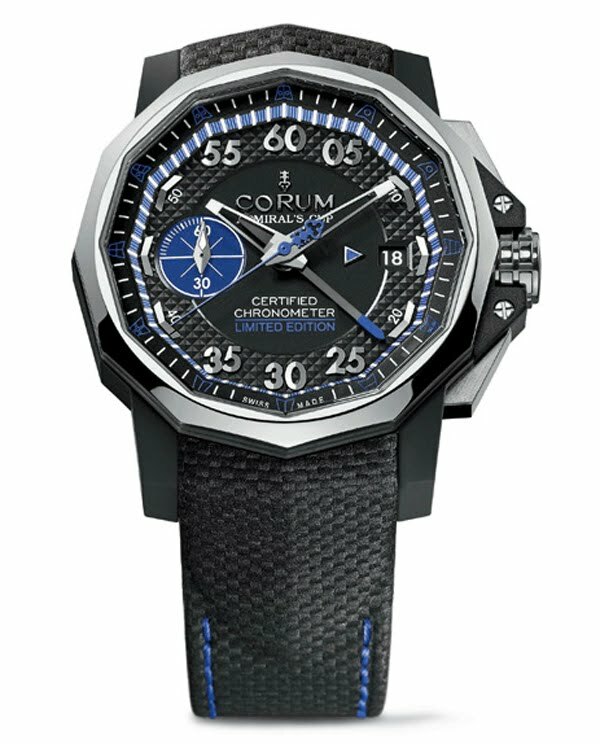 In contrast with the extreme black design of the case featuring the twelve-sided shape that has become a Corum signature, whiletrademark regatta blueaccents reflect the maritime world to which the model so clearly belongs, enlivening the seconds hand and the tip of the minute hand of the chronograph function, the small seconds counter, the Limited Edition logo, as well as the minute circle surrounding a stylishly decorated dial. This 30-piece limited edition is equipped with a mechanical self-winding CO960 movement that is chronometer-certified by the COSC. The House of Corum will also be in the starting blocksitself on June 16, aboard the D35 Okalys-Corum that it has supported since 2009.